Inner-City Avalanche take final instructions from Galton Taylor and First Vice President of the Jamaica Basketball Association during a game in the Western Conference. Avalanche missed out on a place in the All-Island playoffs after having failed to win an encounter. 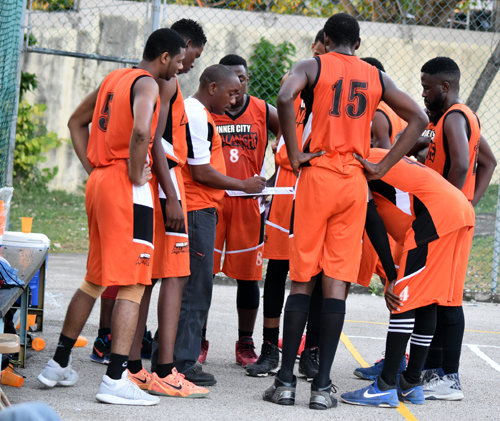 Granville Jaguars reaffirmed top spot in the Jamaica Basketball Association Western Conference League with a 74-41 clobbering of Inner-City Avalanche as Preliminary round action came to a close at the weekend. Jaguars, with just one defeat from their ten matches played, led all the way as they trampled their winless and listless-looking opponents. Dave Black and Tafari Vassell led the scoring for the winners with 16 and 15 points respectively, with Vassell also hauling down 16 rebounds. All-Island Under-19 winner, Alek Gilchrist, also gave support, adding a double-double, 11 points and 10 rebounds, while 10 points came from Levar Rose. Fabian Julian, 13 points and seven rebounds, led the way for the Avalanche. The Jaguars, without being at their flamboyant best, were merciless throughout as they ran rings around their at times clueless-looking opponents, who ended the campaign without marking off a tick in the win column from ten games.